There will be Card and Cash Turnstiles open at all Meetings. We can accept all denominations of Cash and Notes up to £20.00. Under no circumstances will £50 Notes or Scottish Bank Notes be accepted due to the frequency of Fraud in these denominations. In the event of a rain-off after racing has commenced, your re-admission ticket will be valid for reduced admission at the full-paying Adult ticket price minus £1 per heat for each heat completed up until heat 10 when a result will be called. Reduced admissions will be available for any of the following three meetings outside of B.S.P.A. Shared Events. Those unable to attend within the time scale can apply by post to the Speedway Office. To find Eastbourne by road: If you are driving down from the North, London, or M25, then leave the M25 on the M23 junction (signed for Gatwick and Brighton) and follow the M23. Follow the M23 (turns into A23) until you reach the the A27 junction, just before you reach Brighton. Then follow the A27 and signs heading east, until you reach Eastbourne. From the West, or the South Coast, you can approach Eastbourne from the M27 (turns into the A27). From Kent, it depends where you start from. From North Kent you could travel via the M25 / M23, or from South Kent you could follow the A21 until Battle, then cut across to Pevensey Bay and Eastbourne. Arlington Stadium is north of Eastbourne. It is signposted off the A22 Hailsham by-pass. From London, there are direct trains to Eastbourne from Victoria station and London Bridge station. You might also catch the next fast train to East Croydon and change there. There are also direct trains from Brighton, Hastings and Ashford. The nearest station to Arlington Stadium is at Polegate, which is served by trains from London, Brighton and Ashford. It is just over an hour’s walk to the stadium, much alongside a busy, fast road. Taking a taxi is the best option. Matchday Requests: Please click here to e-mail or contact us via the Contact form below 24 hours in advance of the start of the meeting. For all other queries, please also use the contact form below and we will get back to you as soon as possible. No video, zoom or close range photography is permitted at Eastbourne Speedway , except by those with prior accreditation from the BSPA and/or the Promoter. The Promoter reserves the right to exclude anyone not complying with this Policy. This includes all forms of filming and also streaming, live or retrospectively on any form of Social Media or public platform, that do not have the required Consents. If anyone is found to be in breach of this Regulation they may be excluded from The Stadium and subject to legal action. If you feel you have a legitimate reason to film or video, please Contact us for the necessary Promoter accreditation. Any BSPA Accredited photographers should contact the Club prior to attending any Meeting in an Official Capacity; unless on the Eastbourne Staff Pass List; as numbers are strictly limited particularly in The Pits and Centre Green Areas. Entry may be refused to film in an Official Capacity; without Prior Approval from Eastbourne Eagles Ltd.
All material published on Eastbourne-Speedway.com and/or Eastbourne Eagles Social Media Feeds (Club Facebook / Twitter / Instagram and Eagles TV in conjunction with The Speedway Portal) is subject to copyright ©. 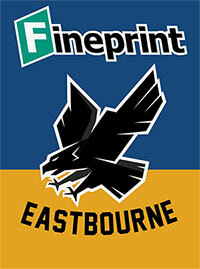 Eastbourne Eagles Limited (Company Ref 11727388) reserves all rights. Any redistribution or reproduction of part or all of the contents for any purpose whatsoever is prohibited unless prior permission in writing has been given. Requests to reproduce any written material, videos, audios, illustrations and photographs must be made in writing. Express written permission must be given by a Company Director and/or Club Promoter before any publication in print, digital media (including social media) and broadcast is used. Sign up with your email address to receive news and updates from the Eagles such as discount codes to our shop, weekly updates and more!